March is the month of International Women’s Day, and while this day invites feelings of jubilance, as it brings to attention the importance of gender equality, it is also evocative of a long, weighted history of oppression, both cultural and sexual, in the portrayal and treatment of women. The last century has been significant in bringing about a changed, harmonized representation of women, and in eradicating discrimination. Women have come a far way in shifting their image from one of containment— in opinion, intelligence, sexual pleasure— to one of assertiveness. In North America, long gone are the days of stereotypical ideas regarding the place and role of the woman. That is not to say that the fight is over— we are still fighting for feminism. In certain fields, for example, women continue to receive lower wages than men for the same work. But feminism and womanhood are more complicated than the legal system can account for: the terms hold a much broader meaning, and take on social and emotional responsibilities. Cristina Perissinotto’s Tigers and the CEO addresses feminism in a way that is relevant today, in ways that go beyond legal equality. The poems in the collection embody the complexity of the question: “what does it mean to be a woman?” and put forth a heartfelt image of passion, emotion, and strength, as the speaker explores the Self in a way that is both stark and vulnerable. The speaker takes us on her travels— to her hometown in Italy, to Dublin, to Milan— and through the exploration of her surroundings —both well-known and novel— explores both deep-rooted parts of herself, and newly discovered ones. The collection is constantly in motion: a finger traces the silhouette of a lover’s body, a lovestruck speaker crosses borders, “papers sprout wings and fly all over the moon”. Just like this, the idea of womanhood is always in motion, always fusing with each poem, as in reality, it does with each individual woman. The question “what does it mean to be a woman?” in a positive, psychological sense lies buried under a pressing lack of basic human rights. Tigers and the CEO describes the epic encounter between two characters representing, respectively, the realm of emotions and the logic of business. Through powerful language, the author portrays a series of instants in which the two worldviews — the passionate and the passionless — face one another. The result is a collection that cuts to the core of what it means, for a woman of the new millennium, to remain herself while facing the radically different Other. 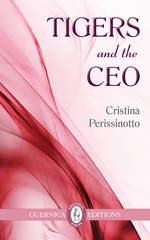 Tagged with Book of the Month, Cristina Perissinotto, International Women's Day, March, Tigers and the CEO.